The women of S&C practice in the most important areas affecting the global economy and they hold key leadership positions at the Firm. We serve on the Firm’s Management Committee and other Firm committees, act as managing partners in offices around the world and head a wide range of practice groups and practice areas. We believe that there is no better place for women lawyers seeking challenging and meaningful careers. The best way to learn about the many opportunities available to women at S&C is to talk to us about our practices, our career paths, why we chose S&C and what matters to us—both inside and outside of the Firm. We encourage you to explore our website, to read our latest issue of S&C Women—Leading the Way and, most importantly, to reach out to us. The Women’s Initiative Committee (WIC) was formed over a decade ago with the mission of supporting the Firm’s efforts to recruit, retain and advance our women lawyers. Comprised of roughly 40 women lawyers practicing at all seniority levels in S&C offices around the world, the WIC provides professional development, networking and mentoring opportunities through both formal and informal programming and social events. We encourage you to visit our WIC page to learn more about what we do. Rita O'Neill co-heads our Private Equity practice. Annie Ostrager co-heads our Labor and Employment practice. S&C has more than 300 women lawyers worldwide. S&C has elected 16 women to the partnership in the last ten years. Alison Ressler is on the Firm's management committee and responsible for the Firm’s practice in California. She also co-heads our Private Equity practice. Sharon Nelles is on the Firm's management committee and is Co-Secretary of the Managing Partners' Committee. 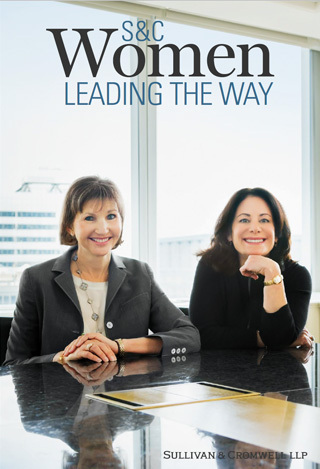 Women lawyers at S&C represent 65 different law schools. Tracy Richelle High is co-Deputy Managing Partner of our Litigation practice; co-chairs both the Firm's Diversity and Women's Initiatives Committees; and co-heads our Labor & Employment practice. Cathy Clarkin is Deputy Managing Partner & Associate Development Partner of our Capital Markets Group and heads our Blue Sky/FINRA Clearance practice. Julie Jordan co-heads our Labor & Employment practice. Kathleen McArthur co-heads our Commodities, Futures and Derivatives practice and is co-chair of the Firm’s Women’s Initiatives Committee. Nicole Friedlander co-heads our Cybersecurity practice. Melissa Sawyer is a General Practice Associate Development Partner, co-heads our Corporate Governance practice and is one of our three Summer Program Heads. Stephanie Wheeler co-heads our Associate Development and Training initiatives. Zena Tamler co-chairs the Firm's Associate Experience Committee. Women make up almost 60% of S&C’s Estates & Personal Group. Amanda Flug Davidoff is co-Deputy Managing Partner of our Litigation practice. Inosi M. Nyatta is the Finance and Restructuring practice Associate Development Partner, co-heads our Project Finance practice and is responsible for the Firm’s practice in Africa. Two of S&C's offices are headed by women. Chun Wei is Managing Partner of the Hong Kong office and responsible for the Firm’s Asia practice. Gwen Wong is Managing Partner of the Beijing office. Women make up 80% of lawyers in our Beijing office. Marion Leydier co-heads our Insurance practice. Sarah Payne co-heads our Capital Markets Group in California and Asia and our Technology, Finance and Mergers & Acquisitions practice. Renata Hesse and Yvonne Quinn co-head our Antitrust practice. Laura Kabler Oswell co-heads our Foreign Corrupt Practices Act practice and is also the Hiring Partner for the Palo Alto office. Whitney Chatterjee co-heads our Investment Management and Alternative Investment Management practices. Camille Orme is co-chair of the Firm’s Women’s Initiatives Committee and Deputy Associate Development Partner for the Financial Services Group.